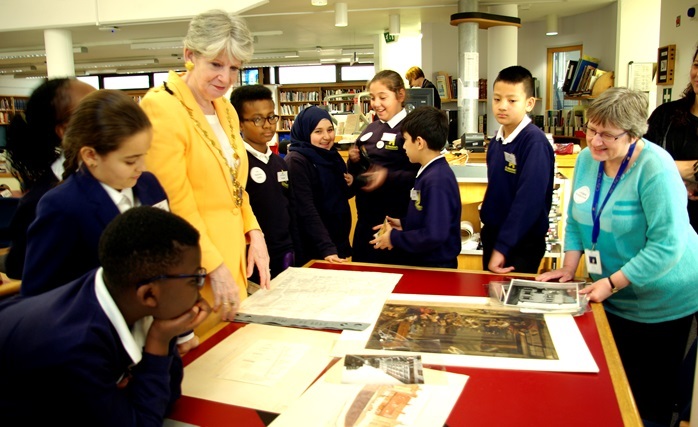 At Westminster Archives we welcomed students from St Matthew’s CE Primary School, hoping to give them a flavour of future employment, a sense of achievement and a fresh perspective on the Archives Centre’s role within the community. Acting as ‘History Detectives’ St Matthew’s School also spent time in our search room discovering the resources we have available to the public. Pupils looked at historic maps, photographs and learned how to use our microfilm readers; vital tools for any building and family historians. Looking at historic photographs of Old Pye Street gave our students the chance to see how the area local to their school has changed. Pupils had the chance to demonstrate their knowledge to our volunteer Jelena, Cllr Tim Mitchell and the Deputy Lord Mayor in our closing ceremony. Staff and volunteers at Westminster Archives were really pleased to be able to work alongside the pupils of St Matthew’s CE Primary School for the day, demonstrating to them the varied and interesting roles of our employment. The positive feedback from staff and pupils alike highlighted the fun-filled day had by all! We were pleased to hear similar comments from those taking part in the day at Maida Vale Library and St John’s Wood Library and hope to participate in next year’s event. This entry was posted in Archives Centre, Children / Teens and tagged archives, children, conservation, employment, history, Kids in Museums, microfilm, Old Pye Street, schools, St Matthew’s CE Primary School, Takeover Day, volunteer, work experience. Bookmark the permalink.